By Beth Abramson Brier, My Thoughts Exactly! 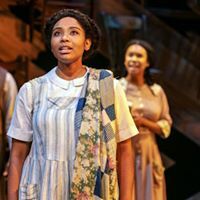 Number 1 on your “to do” list this October: Get tickets to see “The Color Purple” at Paper Mill Playhouse in Millburn, New Jersey. Even before you buy your Halloween candy and scary Lindsey Graham mask, come see this powerful performance. 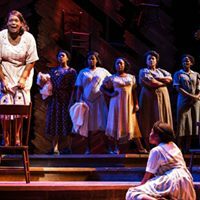 John Doyle directs this production of Marsha Norman’s screenplay based on the novel by Alice Walker. Set in rural Georgia in the early part of the 20th century, it is perhaps more timely than first intended. Read on. In her sister’s place, Celie resigns herself to marry the cruel “Mister” (Gavin Gregory) and endures his beatings and distain. * Celie’s face becomes expressionless and her eyes hollow as Mister tells her time and time again that she is ugly and unlovable. His depravity belies Gregory’s rich voice and magnificent performance. By contrast, enter the very pregnant Sofia, played by the dynamic Carrie Compere, who is set to marry Mister’s son, Harpo (Jay Donnell) - but on her own terms! 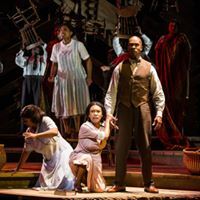 With conviction of spirit, Sofia belts out the show stopping “Hell No!” This number is the iconic, ironic take-away for me tonight as Sofia stands up - as women stand up, as victims of church abuse stand up, as actors stand up, and on and on. As Celie becomes more despondent, Shug (Carla R. Stewart), a blues singer and Mister’s true love, returns. Sickly but brimming with confidence, Celie takes care of her and is smitten - and so is the audience. Doyle’s skillful direction subtly (and not so subtly) depicts their sensuous relationship. Later in Act II, Doyle uses the same technique to make the vulgar simply hilarious. But the greater love - the love of sisters, biological or chosen - carries them all through despair to hope. 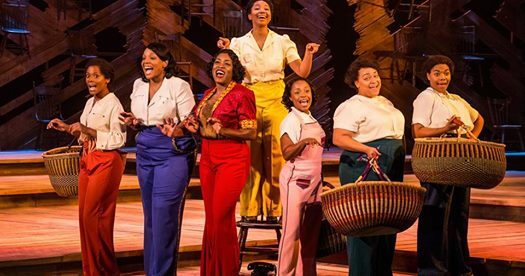 “The Color Purple” is heart-wrenching and beautiful. The audience agreed, quickly getting up from their newly installed plush red luxe velvet seats to offer a standing ovation. with Adrianna Hicks and Carrie Compere. *October is Domestic Violence Awareness month. Find out what you can do to help break the cycle.